EchoStar HDX-410 Android 4.0 HD Satellite Receiver, Echostar has this month unveiled a new addition to their range in the form of the new EchoStar HDX-410 Android based set-top box, equipped with a 5000DMIPS+ dual core application processor, supported by 4GB NAND Flash, 1GB SDRAM. 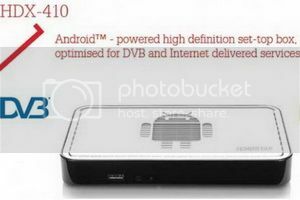 The EchoStar HDX-410 HD Receiver has been rested by Echostar to provide an Android powered high definition set-top box optimised for DVB and Internet delivered services, running Google’s Android 4.0 Ice Cream Sandwich (ICS) operating system. Echostar has developed the HDX-410 to operate either as a stand alone unit or as part of a multi room network if required. For more information jump over to the jump over to the Echostar website for a specification sheet.